Council meeting on Tuesday night. Alameda is the latest Bay Area city to add Just Cause protections that restrict landlords from evicting renters without a specific reason. The Alameda City Council voted, 3-2, early Wednesday morning to amend its rent stabilization ordinance, passed more than a year ago, to include the new protections backed by renters. The council also added language in the ordinance intended to counteract moves by the owner of the infamous Bay View Apartments at 470 Central Avenue. In May, the owner again issued 60-day notices to a group of tenants. Under the amended ordinance, the notices to evict are null and void. 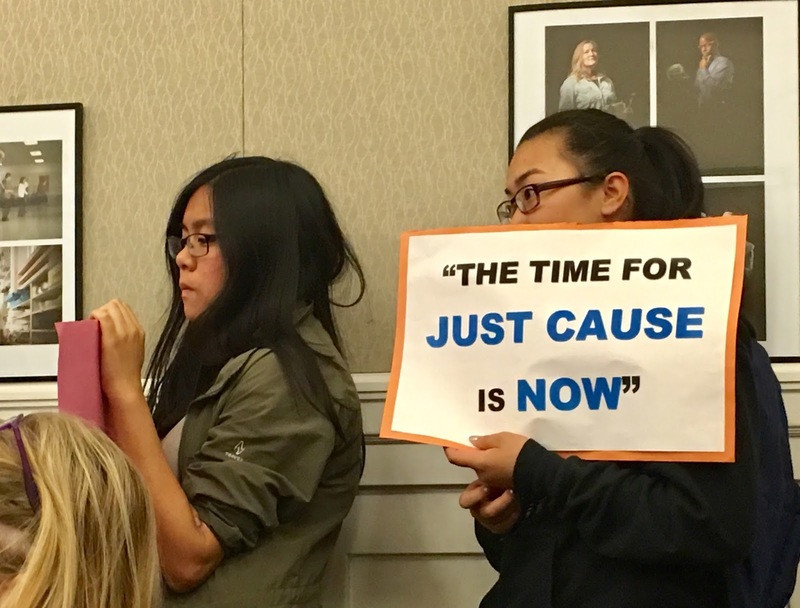 Alameda Councilmembers Malia Vella, Marilyn Ezzy Ashcraft, and Jim Oddie all backed the amendment to add Just Cause to the ordinance, saying it would protect Island renters. Mayor Trish Herrera Spencer and Councilmember Frank Matarrese opposed it in the grounds that additional restrictions on landlords will force them to sell their properties or take units off the market, thereby worsening Alameda’s already limited housing supply. As with nearly every notable council meeting on the subject of rents in Alameda, this one also ran long, ending at around 12:30 a.m. and after more than four hours of debate and public comment. Similar themes also emerged Tuesday night. Numerous renters described themselves as powerless in the face of rising rents and landlords seeking to exploit their properties for maximum profit. Several property owners with limited numbers of rental units told the council that additional restrictions would be too onerous and would either further dwindle their nest egg or force them to get out of the real estate business altogether. They also argued the issue of Just Cause was settled during the recent November elections when a renters-backed ballot measure seeking rent control, and that included Just Cause, was easily turned back by Alameda voters, with just 33 percent support. A competing measure last November to affirm the rent stabilization ordinance discussed Tuesday night was approved with 55 percent. The reason for the initiative’s demise, known as Measure M1, could be attributed to a number of factors, said Oddie, including the overall packaging of the measure that some say was far too an aggressive form of rent control to the potential confusion among voters between the two measures. Oddie and other councilmembers added that one of the compelling features of the city’s rent stabilization ordinance is that it could be tweaked after one year after surveying its efficacy. Ashcraft expressed a more stoic and measured reason for supporting Just Cause, saying she understood the concerns of landlords, but on the whole the city must protect its most vulnerable residents. “When we look at the renters, the impact is even greater to them,” said Ashcraft. She later picked out one unnamed landlord who she felt had publicly threatened members of the council from the dais during public comment Tuesday night. “I can only imagine the threats to tenants,” she said. As perhaps the most progressive member of the Alameda City Council, Councilmember Vella’s support for Just Cause was not questioned. In fact, after support for the amendment was nearly certain, Vella attempted to add another layer of tenant protections by asking city staff to study an Ellis Act policy, presumably to add restrictions to dissuade landlords from removing their properties from the rental market without financial penalty. The proposed motion, however, went too far for Ashcraft, who believes additional restrictions on top of Just Cause would be debilitating to landlords. Spencer and Matarrese, meanwhile, strongly questioned whether Just Cause might have unintended consequences for renters, including a reduction in available rental units. “I feel like it will be detrimental to the long-term health of our community,” said Spencer. “Fewer rentals, I will submit, hurts renters.” Spencer also worried it will force small-time landlords to sell and most likely the properties will be purchased by outside corporate interests with little interest for accommodating renters. It is false to say Just Cause will alleviate low supply of rental units in Alameda, said Matarrese. “That’s the lesson from San Francisco,” he added. Due to the desirability of wanting to live in Alameda, he posited, even if 1,500 new units were built, they would still sell for top dollar and do little to assuage current concerns among renters that they are being priced-out of the city. “That will be the price of relieving fear out there,” Matarrese said of approving Just Cause. Matarrese, though, said the on-going situation with renters at 470 Central Avenue is “criminal,” including allegations the owner of the building, San Jose businessman Matt Sridhar, is harassing tenants, including a claim by that someone impersonating a police officer visited the apartment building. In many ways, the mass eviction of 33 families at the Bay View Apartments two years ago was the flashpoint for tenant activists in Alameda to rally around. Sridhar also clashed with Alameda public officials after he immediately moved to use a loophole in the rent stabilization ordinance to again evict tenants just days after it was approved in March 2016. Posted in 470 Central, Alameda, Alameda City Council, amendment, Frank Matarrese, just cause, landlords, Malia Vella, Marilyn Ezzy Ashcraft, Matt Sridhar, rent stabilization, renters, Trish Spencer. Bookmark the permalink. Since the city finds it ok to allow the bigger properties to not pay the same rate for the school issues, it's not clear to me why they can't to the inverse and exclude owners of a small number of units from these type of actions. Owning one or two rental units is in no way comparable to being an out of town corporate owner of dozens, hundreds, or thousands of units all over the Bay Area.